Beading looms range from the most basic cardboard box loom to a very sophisticated heddle loom. There are adjustable looms, upright looms, flat looms, looms that sit on your lap or desk, and easel type looms. They all serve a purpose, and each one of them is great for a particular style and type of beading, skill level, or budget. Use this overview to understand the assortment of popular types of beading looms, links to buy them, and what makes these beading looms unique. You are sure to find a loom perfect for your experience level, project type, and budget. Wire frame looms are perfect for beginners of all ages. The wire frame bead loom is where it all starts for many beaders. It is the most basic and inexpensive bead loom and widely available in craft stores and online. Similar models are made by Cousin, Darice, and BeadSmith. This is the perfect loom to get started and learn the basics. Many beaders stick with this loom because it is easy to use and effective. The design of the wire frame bead loom is simple; a wire frame is shaped to support two wooden dowels (warp bars) and two metal spring (called warp coils). These types of looms are typically about 3 inches wide, so they are perfect to make bracelets, pendants, amulet bags, longer beaded straps for necklaces, or hat bands. 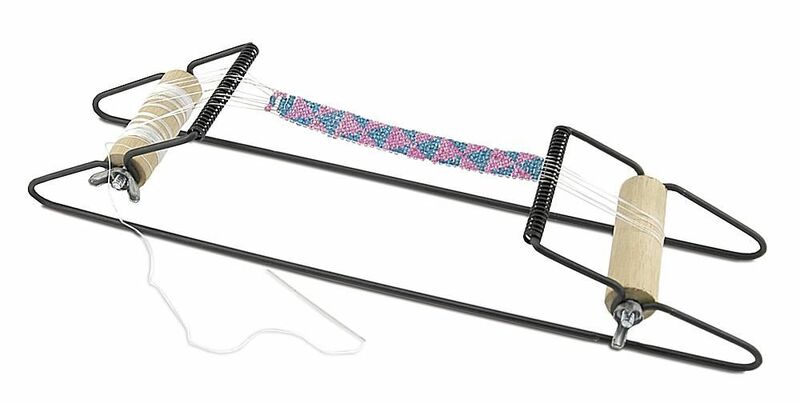 Cousin offers a large version of the wire frame bead loom that is 6.5 inches wide so it can be used to make wider items, such as small purses. If you warp the loom using a method called winding on, you will be able to make longer pieces of beadwork. There are a couple of downsides with this simple loom. The loom lies flat on a surface which can be a difficult position to loom for a long time. Also, the warp bar dowels are attached with turn screws. They can be hard to get in place just right and if they slip, you will lose tension on your loom project. It's helpful to buy four washers at the hardware store, loosen the bars, and add a washer on each side so it sits outside the frame. It will provide a more even hold and avoid slippage. Many of these looms are sold as a starter kit and include beads, thread, and needles. These supplies are often a very small amount and lower quality products so they may cause some frustration. Plan to buy a few tubes of Japanese Cylinder beads, some WildFire, Fireline or Nymo beading thread, and beading needles to get started with proper supplies. Fixed frame looms may be made of wood or plastic. The primary feature of a fixed frame loom is that the length of the loom cannot be adjusted to be longer or shorter. Technically, a wire frame loom is also a fixed frame loom, but a wire frame provides the ability to roll the beadwork and make a longer piece. Wood fixed frame looms are similar in design to wire looms except they feel more solid and sturdy. Some wood frame looms are wider than wire frame looms so they can be used to make larger beadwork designs. Models differ in their style of warp separator: some have metal warp coils or springs, others have a long metal bolt, and still others have cut-out notches. Ojibwa bead looms are traditional Native American style looms of a very simple design. They typically have two end warp bars separated by dowels. Some models include different size dowels so they can be converted to support different length beadwork. A variety of Ojibwa looms and looming information can be found at The Wandering Bull website. Wooden frame looms range in price from relatively inexpensive to very pricey, depending on quality and size. A smaller, beginner model may cost around $20, whereas a larger, professional model can cost over $100. The most popular plastic fixed frame loom is the Jewel Loom by Beadalon. This loom was designed by Julianna Avelar and is a step up from previous plastic looms that required you to wrap the warp threads all the way around the frame. The addition of a button to the back allows you to use less thread and makes it easier to warp. This is a good beading loom for beginners since it is economically priced and simple to warp and get started weaving. The loom is 3.5 inches wide and 13.5 inches long, making it very portable. The Jewel Loom is a perfect size for making straps or bracelets. For longer items, you can make two bands and stitch them together. The Jewel Loom has a metal bar that you put in before warping the loom and is removed afterwards to provide tension on the warp threads. It can be difficult to remove the bar and can also cause you to break the loom plastic. You can loom with the metal bar in place, so if you are having difficulty removing it and your tension seems fine, try that. A downside to these looms is that the plastic is prone to cracking and breaking. Another nice addition to the Jewel Loom is that you can purchase a Jewel Loom Inspirations book that features multiple project tutorials that are made on the Jewel Loom. Wood adjustable bead looms are designed so you can elongate the frame and set it to your desired length. It's a good option when you want a compact loom plus the ability to create extra-long bands of beadwork, such as belts. Prices typically range from around $25 to $80. There are several different styles of adjustable frame looms. Crazy Crow Trading Post carries several different types of Native American style adjustable wood frame bead looms available alone or as kits. You can also research information and examples of typical Native American tribal bead color preferences. The Ricks beading loom is a popular adjustable frame beading loom that has a couple of advantages. The best is a warping method that leaves you with only two warp threads to weave in at the end. This makes finishing much quicker. Ricks beading looms also don't use a warp coil or other warp separator, so the spacing between warp threads is dependent on the beads you use. It does come with a warp separator guide to help you measure and separate them initially, but then the beads do the work to keep them that way. You don't need to limit yourself to a plastic loom to have something portable. The Little Ricky beading loom has the same benefits as the regular Ricks beading loom, just in a smaller size that makes it perfectly portable. It does require some assembly. In addition to a simpler finishing method, Rick's loom has an active group on Facebook called The Ricks Loomatiks that is a great place to ask questions and share projects. Upright bead looms typically have the most options, are more expensive, and are used by more advanced beaders. For example, upright looms are adjustable, have interchangeable warp coils to adjust warp thread spacing and work with other optional accessories such as a shedding device. To many people, they are the most comfortable looms to use because the beadwork stands upright in front of you and you don't need to lean over your work or prop it against something to change the working angle. The most popular upright looms are made by Mirrix Looms. They have a wide variety of models available from the portable 5-inch Loreli Loom to a 38-inch (appropriately named) Zeus loom. All Mirrix bead looms can be used for bead looming or tapestry weaving. Upright looms are more expensive than other looms ranging from around $100 for smaller models to $500 for the really large ones. You should consider investing in an upright loom if you know you enjoy beadweaving and prefer the upright orientation or would like to weave continuous sheets, beadwork, or beaded tapestries.